Playing the noblest American of them all, Chris Evans is easy to underrate. As in previous installments, Captain America: Civil War shows the World War II hero, frozen and revived for our complex times, as a touching and skeptical immortal. Our hero could be seen as a symbol of the U.S. government's unilateral actions in foreign affairs, but directors Joe and Anthony Russo's terrific action opus addresses directly what Batman v. Superman hinted at. It's the most expensive, entertaining movie anyone's made about blowback. 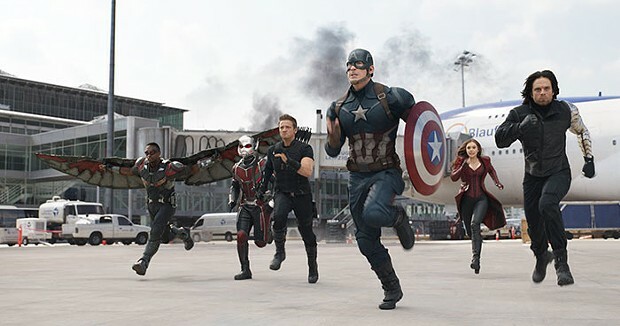 A squad of the Avengers are in Lagos, Nigeria, preventing the theft of a vial of ebola-like serum. During the epic shootout, the powerful telepath Wanda Maximoff, the Scarlet Witch (a hypnotically pretty Elizabeth Olsen), saves Captain America's life but accidentally kills a dozen bystanders. An international outcry builds on top of the Balkan catastrophe in last year's Avengers: Age of Ultron. The secretary of state (William Hurt) announces an international accord in which the Avengers will be leashed by U.N. restrictions. A weary Tony Stark (Robert Downey Jr.)—the vincible meat inside the invincible shell of Iron Man—urges his fellow heroes to sign. Captain America has his doubts. In between them is Natasha Romanoff, the Black Widow (Scarlett Johansson). In Vienna for the signing of the accord are representatives of Africa's fictional Wakanda, the only source for the super-powerful ore vibranium. What happens next demonstrates why a king and his heir should never travel together. A terrorist attack is seemingly carried out by the Winter Soldier, formerly known as Cap's wartime buddy Bucky (Sebastian Stan). Pressured, the Avengers crack. You get to travel a bit in the film—Berlin's Spree River, the Lagos marketplace, stormy seas, icy dungeons, even a stopover in Cleveland. Amidst this escapism, the audience gets something to ponder: the question of what to do with "unlimited power and no supervision" isn't just the Avengers' problem, it's America's. 'Captain America: Civil War' is playing in wide release in the North Bay.